Saturday, August 22 1908 -- The local Democrat's convention proceeds pretty quietly. Herriman finds nothing exciting to report, so sketches faces again today. You, I and Herriman all agree we're ready for this boring convention to wind up, and thankfully, it has. Connie, April 4 1937, courtesy of Cole Johnson. 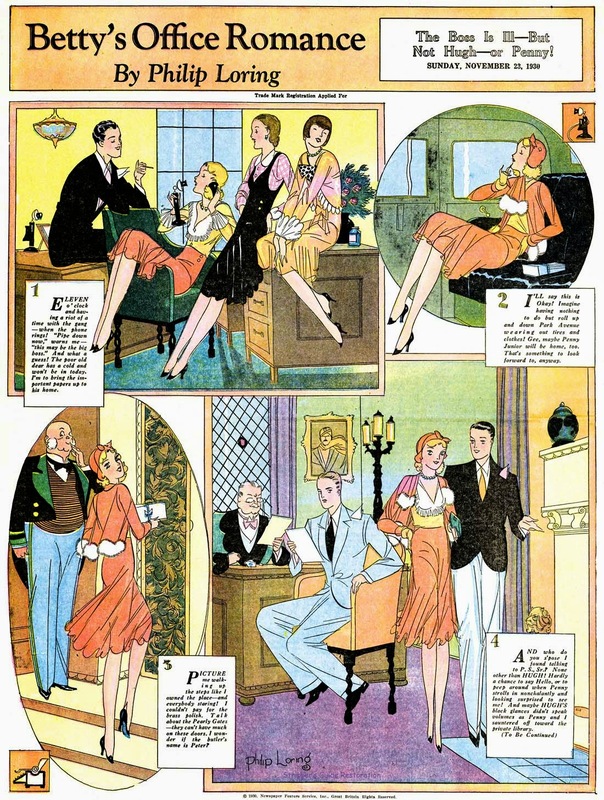 Here's Betty's Office Romance, a magazine cover comic series distributed by Hearst's Newspaper Feature Service. You know the drill by now regarding the subject matter (don't worry, they live happily ever after). I've stated here before that I'm pretty convinced that Philip Loring, who is credited on a handful of these magazine cover series, is actually Paul Robinson working undercover. It helped my theory, I always thought, that this Loring fellow never bothered to sign his work. So naturally what do I pull out of my collection but this sample, which is signed. Oh well. I still stick with my theory. Betty's Office Romance played out on Sunday magazine covers from October 19 1930 to January 25 1931. Cute typewriter icon in the lower left corner. Great costumes and decor...the text in gossipy-flip tone. There's something about the angles of the lines. 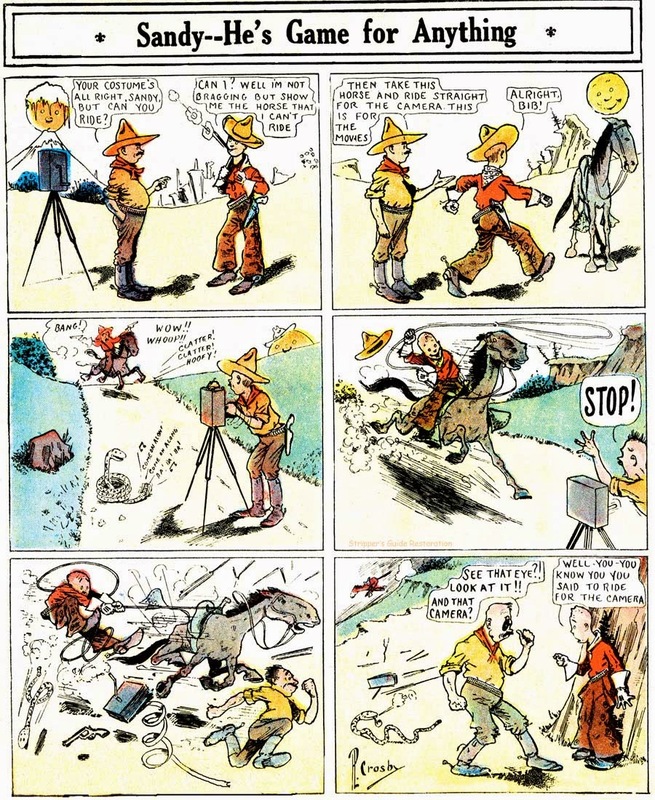 Charles H. Spencer, whose delightfully noodly, loose cartooning style I find very appealing, apparently got into and out of the profession in short order. His only known series, a whopping two of 'em, are with the Philadelphia Inquirer, both in late 1906. Today we look at Fatty English, also known as Mr. English, about a rotund British big game hunter. 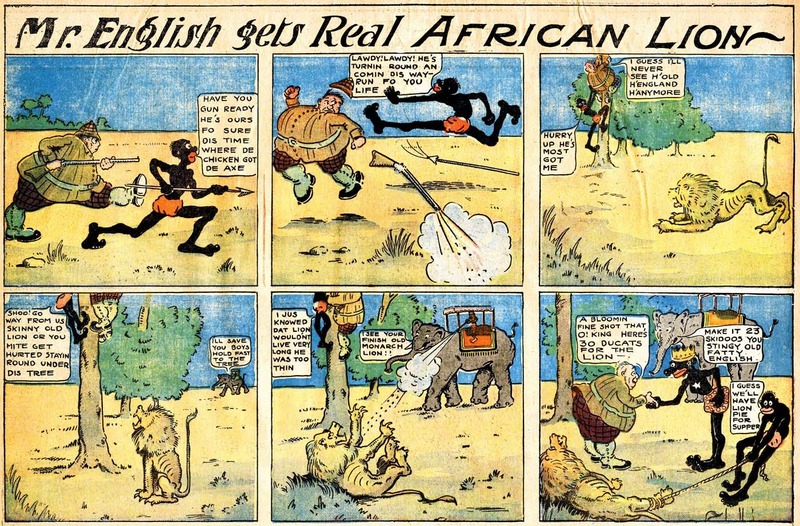 English is dead set on bagging himself an African lion, assisted by his stereotypical jet black guide. His hunting expedition is under surveillance from the local king, Vilkilloo III, who appears regularly to extract some tax revenue from the bumbling duo. Fatty English ran from September 30 to December 2 1906. Likewise re: 20's use of 23 skidoo......apparently a long time before.....and accredited here to TAD ! "'Tad,' Cartoonist, Dies In His Sleep.". New York Times. May 3, 1929. "Thomas A. Dorgan, Famous For His 'Indoor Sports,' Victim of Heart Disease. Was A Shut-In For Years. Worked Cheerfully at Home in Great Neck on Drawings That Amused Countless Thousands. His slangy breeziness won immediate circulation. It was he who first said 'Twenty-three, Skidoo,' and 'Yes, we have no bananas,' 'apple sauce' and 'solid ivory.' Other expressions that are now part of the American vernacular include 'cake-eater,' 'drug-store cowboy,' 'storm and strife,' 'Dumb Dora,' 'dumb-bell,' 'finale hopper,' 'Benny' for hat and 'dogs' for shoes." "23 Skiddoo" refers to 23rd street, New York City, where the once tallest structure, the Flatiron Building stands.the configuration of the building and the layout of the street lead to the phenomenon of powerful winds nearly constantly going down that street.So the expression was more or less to say, "Blow Away!" 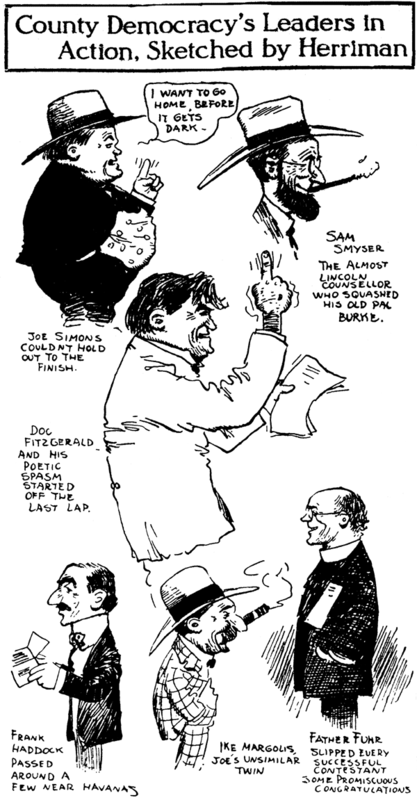 After a very short stint at the lackluster New York Globe, Percy Crosby's career took a big step up at the New York World in 1911, where he became an important producer in their cartooning bullpen. Between 1911 and 1914, Crosby produced over half a dozen series for the World's Sunday and weekday papers. Although Crosby produced some of his earliest kid comics for the World, predicting his later masterwork Skippy, he also produced some soon forgotten but excellent series like Sandy (He's Game For Anything). 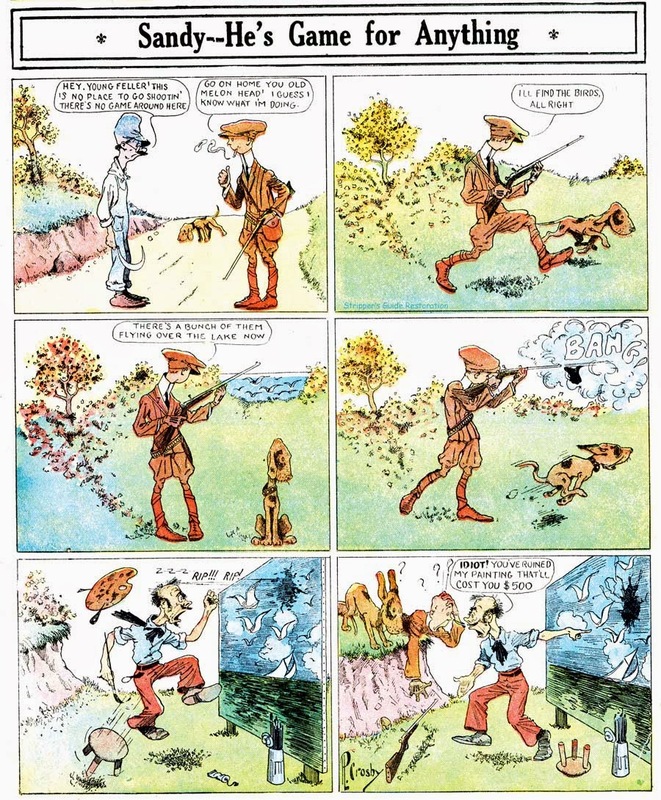 In his small quarter page space in the World's Funny Side comic section, the Sandy strips didn't get a lot of room for character development or plot. In six small panels the cocksure Sandy would take a devil-may-care attitude, and then would be taught a lesson in humility. It was nothing unusual for the comics page, and the gags did not have any extra special spark. What did spark like mad was Crosby's still-evolving drawing style. 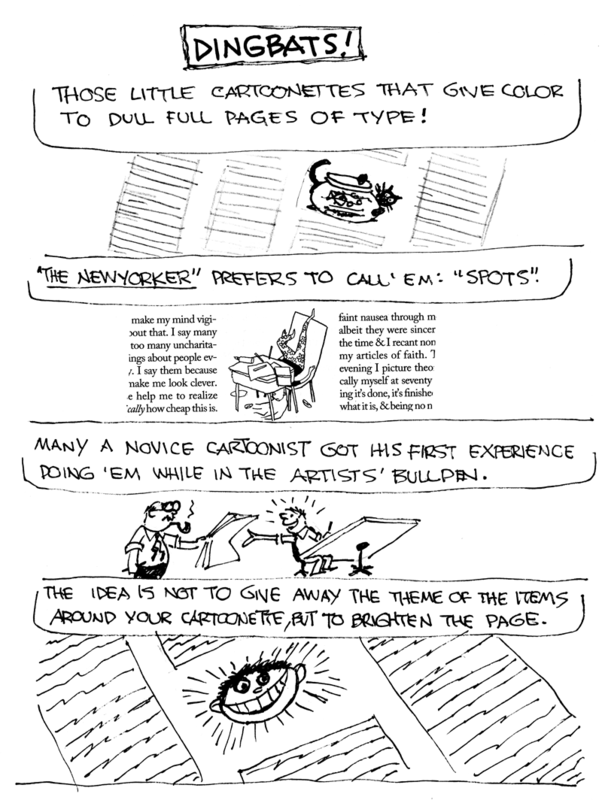 He showed off his artistic chops by producing well-designed layouts, and exhibiting a flair for humorous anatomy. Sandy ran from September 15 1912 to February 2 1913. The color Sunday comics are just So Marvelous! Maybe the kids today will say what wonderful comics were online on their iphones and ipads one day....I'm doubtful. The heyday of newspapers, magazines was so fertile. Today, the best/best paid artists are.... ? Doing graphic novels, comic books, computer graphics. Thankyou for celebrating this wonderful artform. Where can color comics be seen? A few compilations and....... here. Other places? I'll have to check out your links. We discussed Tad's Sunday series And His Name Was Bunk awhile ago, and I mentioned that Tad was not one to let a good character languish. The dog Bunk was used in his sports and other cartoons for years afterwards. Here's a few samples from Cole Johnson of his weekday appearances. The top one is from 1907, before the Sunday series, the bottom one is from 1908, after it. 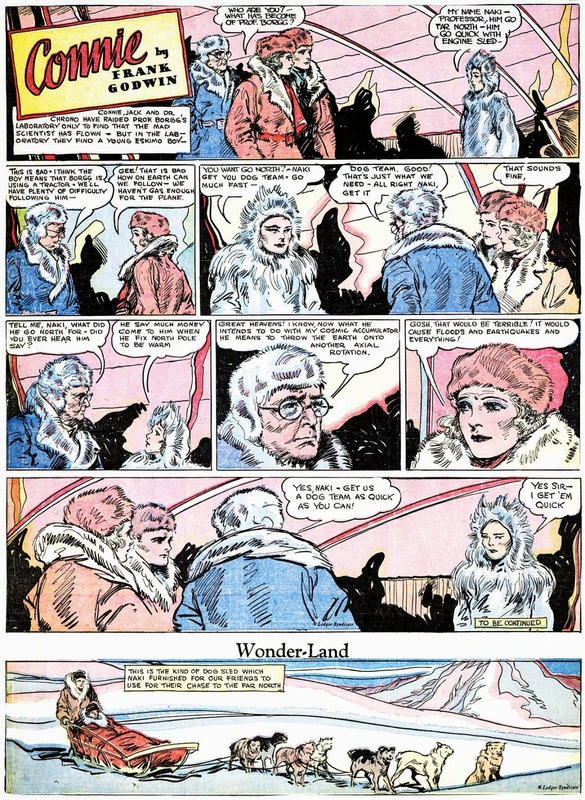 The top cartoon is especially interesting as it comments on the 'celebrity trials' of the day -- you may be familiar with the Evelyn Nesbit/Harry Thaw trials that captured the fascination of the whole country, but that was just a particularly memorable one in a long line. The sensational New York newspapers kept a constant vigil for trials that could make for lurid headlines, and covered them to a degree that makes the O.J. trial seem positively sane and sober by comparison. That reminds me, I'd like to make a reading suggestion to you -- The Murder of the Century by Paul Collins. It tells the story of one of the first trials that was run just as much in the pages of New York's yellow journals as in a courtroom. In fact, if not for the New York Journal and World, the case most likely never would have even identified a suspect to put on trial. I resisted buying this book for quite awhile because of the tagline on the front saying that the crime "sparked the tabloid wars". Of course there were no sensational New York tabloids for more than twenty years after the trial, and that line gave me pause as to the quality of research that went into the book. When I finally succumbed I was treated to a great read that was very well researched. I imagine some marketer insisted on that idiotic line, and I shouldn't have damned the author for what I now see as well-meaning but factually incorrect marketing fluff. Oh, one other thing -- notice the behatted dog in the bottom cartoon? This is an early appearance of another Tad mainstray (sorry! ), Silk Hat Harry, who would be in the Tad spotlight during much of the teens. Tad is fantastic! I'd love to see a biography someday on him--he likely packed three lifetimes in one! I have a 1911 collection of DAFFYDILS published by the T.A. Dorgan Co. that's a riot for the catchphrases alone ("OFFICER, DUST OFF THE ELECTRIC CHAIR! ").